The greatest content is lost if you don’t aim it at the right people – those who are interested in it. You need to know who you are talking to and how to talk to them. There is a lot of information on demographics and psychographics, how to analyze them and find out who your “average” customer is. In the case of a martial arts academy and in regards to social media especially, I came up with three big groups to start with. You can then break them down further.. This is your support group rather than your competition. Pilates, Yoga and Fitness industries are the real competitors and they are far far ahead of us when it comes to visual communication. Not lastly because all the big apparel brands back them up which we don’t have in the martial arts industry that much. Your peers are most likely to react to content about seminars, comps, achievements, “nerdy” martial arts stuff (new weapons, new armour, new mats and the like), stand out photos… There is a bit of friendly competition going on so if you raise your standards it’s likely you’ll motivate others to do so as well which then raises the standard of the whole industry. This creates more awareness for our “sport” which in turn should result in more interest and more leads for your school. 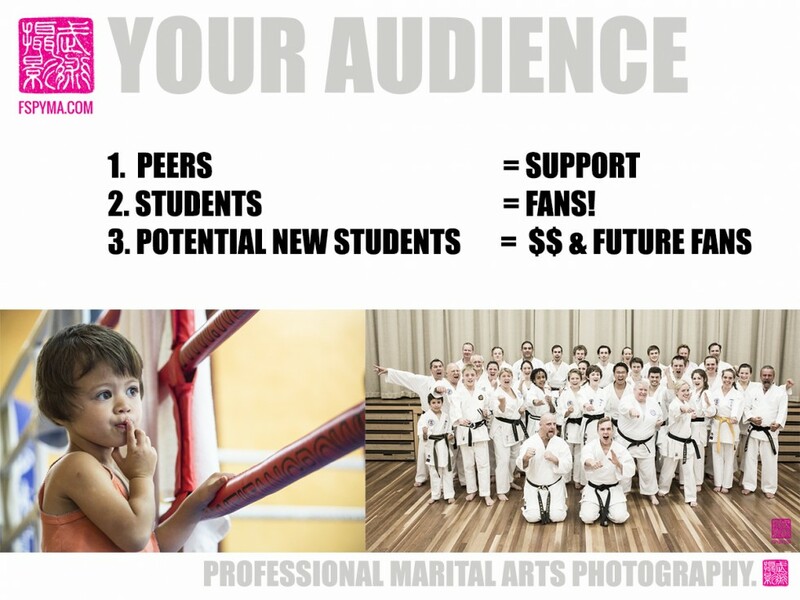 This is probably your most important audience as they are already your “fans”! And it is easier to keep a client than it is to acquire a new one. So keep them engaged! If you create visual content that excites them – a great photo of them in action for example, they will most likely share it – Who doesn’t like a photo of themselves in action! Most of your students will regularly talk to their friends & family about their cool martial arts school with enthusiasm but it’s hard for people to imagine what exactly we do in training. If you create visual content so they can SHOW them – that’s a different thing entirely. Everyone in my social circles know I am a Martial Artist but when I posted the first picture of me training, the likes and comments went through the roof! That’s the power of a picture… So if your students share their photos on their pages, chances are high that these friends “who always wanted to try martial arts” will finally do so. In this case they are more likely to interact with your website than social media and I can only repeat what I wrote in this post. Make them feel safe, welcome and like they fit in. And don’t forget – they are your future fans who will be your walking business cards!